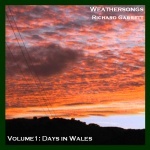 An album of 14 short pieces of music derived, in real time, from the weather conditions in Southern Snowdonia on 14 different days over one year. 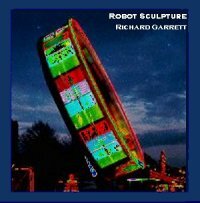 Fifteen original tracks of generative music “sculpted” into new shapes and augmented by conventional instruments. The sounds range from sparse science-fiction soundscapes to statistically dense rhythmic cycles to “zappa-esque baroque whimsey” touching jazz, folk and rock along the way. An album of songs and instrumentals. Most of the material is a lot “tighter” in composition than AMOS and makes extensive use of sequenced information. Features vocals, electric and acoustic guitars, guitar synth, bass, harmonium, synthesizer and drum machine. Sean Goldthorpe guests on trumpet. An album of songs and instrumentals featuring vocals, acoustic and electric guitars, bass and the occasional drum machine. Features Richard Garrett (electric & acoustic guitars, bass, vocals); Sean Goldthorpe (electric & acoustic guitars, bass, trumpet, vocals, syndrum) and Myk Soar (drums, 12 string guitar, vocals) with Flange the Robot (an early BBC microcomputer programmed by LRTC) on sequences and “widdly-widdly” noises.